Look closely at grill grates across the country this summer, and you may notice something new kissing the flames. It’s a patty that looks like ground beef, sizzles like ground beef, even bleeds like ground beef — but it isn't made from beef. WASHINGTON — Look closely at grill grates across the country this summer, and you may notice something new kissing the flames. It’s a patty that looks like ground beef, sizzles like ground beef, even bleeds like ground beef — but the Beyond Burger is plant-based. Ethan Brown is the co-founder and CEO of Beyond Meat, the company behind Beyond Burger, and for the last decade, he and a team of scientists and chefs have been working to create a plant-based meat alternative that doesn’t sacrifice taste, texture or experience. “My belief is that people will continue to eat meat, but we can transition from an animal-based meat to a plant-based meat in the same way we transitioned from using landlines to mobile phones,” said Brown, a D.C. native and University of Maryland graduate. The Beyond Burger is not a veggie burger. There are no visible greens, grains or carrots bound by egg and breadcrumbs. Instead, it’s made from protein that’s been extracted from legumes and pulses, then heated and cooled to achieve the desired meat-like consistency. “We believe nature has given us all we need to separate meat from animals,” Brown said. Packages of the pink, beef-like patties are even sold alongside trays of ground beef at grocery stores including Whole Foods and Wegmans. Select locations of the chain, BurgerFi, list the Beyond Burger on its menu. Brown says switching from traditional meat to plant-based meat alternatives has a number of benefits, starting with climate change. “Replacing animal meat with plant-based meat is the single most effective thing you can do as a consumer to limit your emissions,” Brown said. A diet heavy in plant-based foods also helps cut risks for obesity, diabetes and cancer, and Brown says it frees up natural resources to grow plants for human consumption, not just animal consumption. “People love meat. They want to keep eating it, but they’re also having some concerns about it and this provides a way [around that],” said Brown, whose company also makes plant-based alternatives to chicken strips and crumbled beef. 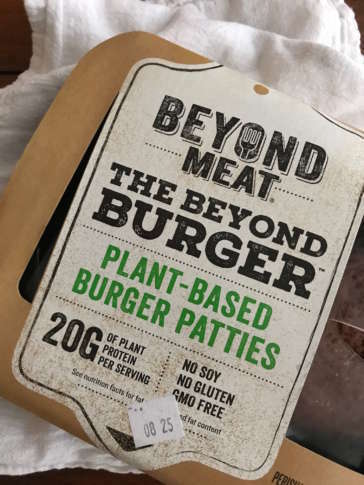 The Beyond Burger is not the only faux-meat burger on the market. A few years ago, Impossible Foods released its Impossible Burger. And while it doesn’t make plant-based meat, the California company Hampton Creek is winning over consumers with its plant-based mayonnaise and cookie doughs. The key to the Beyond Burgers, Brown says, is in the way you cook them. The packages are sold fresh, not frozen, and should be consumed shortly after purchase. There are no microwave instructions on the package, only those for a skillet or grill, and Brown says it’s important not to overcook them. The patties only need three minutes on each side. “It’s going to stay red in the middle like a medium-rare burger,” said Brown, who likes his best with pineapple teriyaki sauce on a pretzel bun.